Apologies for the lack of review on Monday; I had an essay due at noon and updating my blog was unfortunately neglected. Content in her comfortable marriage of twenty-two years, Jane Lindsay had never expected to watch her husband, rad, pack his belongings and walk out the door of their Manhattan home. But when it happens, she feels powerless to stop him and the course of events that follow Brad’s departure. Jane finds an old ring in a box of relics from a British jumble sale and discovers a Latin inscription in the band along with just one recognizable word: Jane. Feeling an instant connection to the mysterious ring bearing her namesake, Jane begins a journey to learn more about the ring—and perhaps about herself. In the sixteenth-century, Lucy Day becomes the dressmaker to Lady Jane Grey, an innocent young woman whose fate seems to be controlled by a dangerous political and religious climate, one threatening to deny her true love and pursuit of her own interests. I chose to listen to this novel on audiobook based on my love of dual-time narratives and how much I'd enjoyed The Shape of Mercy by the same author. Perhaps I would have enjoyed this book more, had I not read The Shape of Mercy, but I'm afraid I couldn't help but compare the two novels. My biggest issue is simply that the modern-day narrative in Lady in Waiting is never directly related to the historical narrative. While the modern protagonist in Meissner's other novel actually connected with the historical protagonist through reading her diaries, Jane doesn't find out who owned the ring until about three-quarters of the way through the book in Lady in Waiting. I think this is what bugged me most about this book. While the reader knows so much about Lucy and Lady Jane Grey, modern-day Jane knows very little about the owner of the ring, even towards the end of the story. I found myself preferring the historical side of the narrative in this book, if only for the fact that it progressed a lot faster than the modern story. At times it really felt like modern Jane wasn't achieving anything in the early sections of the story, just sitting around and brooding about her situation. Thus, the story of Lucy and Jane was much more appealing initially. It wasn't really until towards the end of the story when Jane decides to take control of her life and make an effort in her marriage that I really felt connected to the growth she had made as a character. It's hard to say whether this book was as compelling as other dual-time narratives or The Shape of Mercy since I listened to it on audiobook while cooking and cleaning, so it wasn't the sort of situation where I felt I could put it down and read another book if I wasn't enjoying it. I tend to follow through with an audiobook, and ultimately, I'm glad I did so with Lady in Waiting. It might have taken a while for the contemporary story to get interesting, and it was hard to care about both Janes equally, since their individual stories were told in such large chunks that I was liable to forget about the other character for a while. I do wish that their stories were more connected, and that Jane had discovered more about the ring earlier in the story and had more growth of character at an earlier stage. 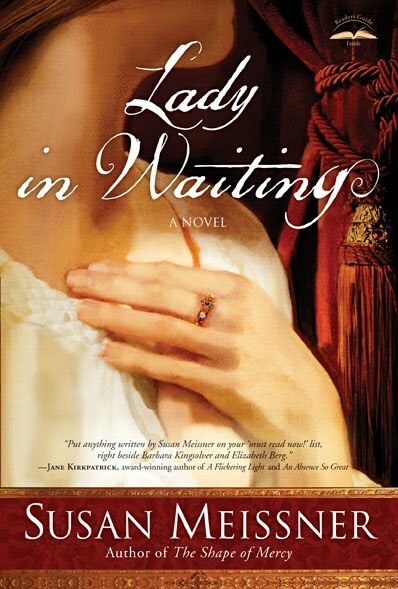 But despite this, Lady in Waiting was still an interesting story, and I liked the lessons the reader could learn from both of the protagonists' lives. Perhaps I was just getting stressed out with the cartons of chopped tomatoes that refused to open this morning while I finished this audiobook, but I felt that the letters at the end of the story were a bit superfluous. I know they were intended to show how the ring had been forgotten for so long, but I'm not sure if they were entirely necessary. Despite this, I'd still give the book 3.5* and will be looking out for more Meissner novels.